He is a solution seeker and problem solver and works hard as an advocate for his clients in an honest, straight-forward and professional manner. He exercises sound and prudent judgment in advising them of their legal alternatives, and his ability to clearly explain how the facts and the law are likely to converge, and what the most likely outcome would be, is of great benefit to his clients. Mr. Hale tries all types of civil cases in both the federal and state courts throughout East Tennessee with specific emphasis in the areas of business-related disputes in contract, corporate, employment, as well as real estate and zoning/land use. He provides general commercial advice to local and national businesses. 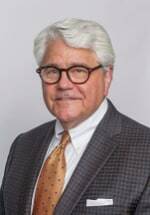 For his corporate law practice, the prestigious, peer-review publication, Best Lawyers in America selected Mr. Hale for inclusion to its list each and every year since 2008, and also selected him as the "Knoxville Lawyer of the Year" in 2012. He has also been included in this publication each year since 2011 for his litigation-commercial, land use and zoning, municipal and real estate law practices. Represented minority shareholders of one of the largest private companies in Tennessee and, by preparing a case showing ways in which his clients were being oppressed, secured substantial value for client's shares. In another instance, was able to prove that his defendant client had a more substantial claim against plaintiff contractor using the contractor's own testimony. His client had been prepared to pay to settle the case. Mr. Hale led a team of the firm's lawyers in the successful representation of a well-known national restaurant chain in the defense of 60 lawsuits resulting from Hepatitis A exposure from consumption of produce supplied by a local supplier of produce and its supply chain. He represented a national developer in a suit to reform the official plats governing a 200+ lot subdivision involving 300+ named defendants, including lot owners, lenders, utility providers and local governmental entities.